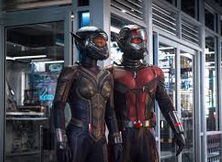 When two diminutive heroes team up on an urgent mission against a powerful new enemy in Marvel Studio’s Ant-Man and The Wasp, the result is action-packed comedy and outsized economic impact in Georgia. New figures released by the studio show the film’s production has Georgia’s local economy buzzing, generating more than $63 million in economic activity, while paying more than $18.6 million in wages to 2,000 local workers. Now commonly referred to as “Hollywood South,” Georgia is the third largest production center in the nation, with films like Black Panther, Guardians of the Galaxy, and other Marvel Studios’ blockbusters powering a super-sized $9.5 billion in total state economic impact. More than $15.7 million spent on local rentals and purchases for set decoration, production, and other supplies. More than $4.4 million spent on lodging. More than $4.4 million spent on transportation, including truck and car rentals. More than $4.1 on hardware and lumber supplies. More than $1.3 million spent on local catering and other food items for the cast and crew. More than $589,000 spent on local wardrobe, including dry cleaning.